Your bad money habits cost more than you think. If you’re stuck in a loop of credit card debt, putting off investing, or committing other well-known financial atrocities, it could add years to your working life and take them away from the cozy retirement you envision. 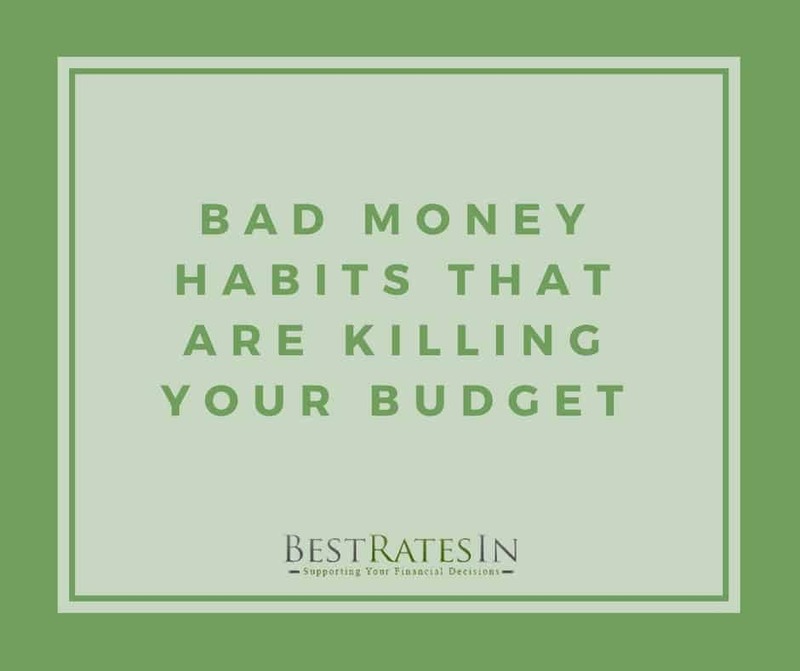 Here are some of the most common habits that kill your budget, along with how to fix them and take back control of your money. They say to shoot for the moon because if you miss, you’ll still land among the stars. Unfortunately, that’s not the case with your finances. Without clear financial goals and a plan to achieve them, chances are you’ll never get where you want to be. It’s not impossible to retire at 40, but that’s a goal that requires specific actions. So is saving for a home, investing in real estate, starting a business, and anything else you want to accomplish. First, get clear on your goals. There are the big things, like saving for retirement or paying off debt, but think about the smaller-ticket items as well. Maybe you want to take a European vacation or splurge on an expensive anniversary dinner. Set a timer for 3 minutes. Use those three minutes to write down everything you can think of that you want to accomplish. Once you have your short-, medium-, and long-term goals, you can break them down into monthly action steps. Now that you’re working towards something meaningful, other areas where you may have been overspending before suddenly seem less important. Your goals can change – some will fall off, others will be added. I like to do this exercise and update my goals once or twice a year. Does it ever seem like your money disappears before it even hits your bank account? The direct deposit clears, you pay some bills, and the next thing you know you’re right back where you started. This is a phenomenon faced by over 78% of the U.S. workforce who say they live paycheck to paycheck to make ends meet. While in some cases it’s a matter of not earning a livable wage, for most it’s an issue of prioritization. I know what you’re thinking: She’s about to tell me I need to start budgeting. Well, you’re wrong. Budgets are a thing of the past. From a psychological perspective, they’re restrictive and, therefore, unpleasant. A spending plan, on the other hand, is goal-focused and empowering, which is how managing your money should be. The difference between a budget and a spending plan is that a budget implies cutting back or eliminating. A spending plan is more active and in line with your financial goals. “I can only spend $x,” becomes “I plan to spend $x.” It’s a little shift that goes a long way when put into practice. It’s not difficult to get started with investing, but the belief that it is deters most. The power of compounding (interest earning interest) means putting it off could set you back tens of thousands of dollars in just a few years. When it comes to investing, the earlier you start, the better off you are in the long run. As a beginner investor, you may think you need a small fortune to get in the game, but the truth is you can start investing with as little as $5. New-age brokerages like Betterment have proven that automating your portfolio is possible. Setting up an account online is easy and takes only a few minutes. Regardless of how much you begin with, the key to investment success is consistency. Convenience is nice, but relying on it too much can have a grave impact on your budget. The area where this most often plays out is food. Stop in for a coffee and muffin at breakfast. You didn’t have time to pack a lunch this morning, so it looks like Qdoba for lunch. A late day at the office means pizza for dinner. These seemingly small expenditures cost thousands throughout the year. According to the Bureau of Labor Statistics, American households spend an average of $3,008 annually dining out. The term “meal planning” used to make me cringe. That is, until I started saving hundreds of dollars a month prepping my meals in advance. Time is the biggest reason why most people avoid cooking at home, myself included. It may take a few weeks to get your system down, but once you do you actually save time planning in advance. Make a list of some recipes that are easy but delicious. Banana bread and a breakfast sausage casserole are a couple of my go-tos. The best foods are ones that store well and last a few days. Then choose 2-3 days a week to do your cooking (mine are usually Sunday and Wednesday). Keep a running list of items to buy so you never have to second-guess what’s in the cupboard. One sure way to sabotage your finances is to keep spending money you don’t have. While not all debt is bad, high-interest debt (e.g. credit cards) can cost hundreds or even thousands of dollars in avoidable interest fees per year. I got my first credit card the day I turned 18, much to my father’s dismay. Even though it was only a $500 secured card, I remember the powerful feeling it gave me to know I didn’t have to wait for my next paycheck to spend money. The debt cycle is an easy one to get into, but takes a bit more effort to break. To break the overspending cycle, consider cutting yourself off from your credit cards. It doesn’t have to be forever, just until you pay off your debt and develop better spending habits. Next, create a debt repayment plan. Take inventory of your credit card balances and interest rates. Using the debt snowball method, start with your smallest balance first. Once that’s gone, move on to the next smallest until all your debt is repaid. To pay off your debt even faster, look for ways to make extra money on the side. Some of these habits are years in the making. Reversing them takes time and diligence, but it’s far from impossible. You’ll be surprised how quickly progress comes and the difference it makes not just in your budget, but also in your overall happiness. Future you will be thankful you started today.